Jason Scotts gathered recent insights from various points of view like neurobiology, healthy food, exercising, and stress prevention to write the condensed booklet Improve Mental Performance: 7 Top Tips & Tools To Stop Overworking Your Brain Now: Methods to Improve Mental Performance Without Increasing Stress Levels. The 7 tips and tools aren’t reflected in chapter titles or a single table. 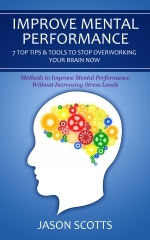 The book’s a slow start with superficial explorations of the importance of mental performance improvement, starting and getting rid of bad habits. Peculiar is the order in the next chapters. First a detailed listing of all kinds of supplements, then a short chapter on a balanced diet. Exercise helps and keeping it all under control as well. The Daniel Plan by Rick Warren e.a. which I recently read was more complete and elaborated. This booklet which reads in 30 minutes can be regarded as an introduction intended for awareness creation. You’ll definitely need a training plan, doctor’s advice, help from buddies, recipes and actual exercises to boost your mental performance. Jason Scotts is one of the two main writers and contributors for the Ultimate How To Guides Series. This series serve as a platform for them to share our great interest and useful information on all areas that I hope will make your life better and fun. Their website is at http://ultimatehowtoguides.com.